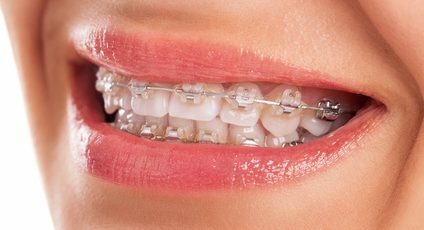 When you think of orthodontics, an image of a teenager sporting metal braces may come to mind. In reality patients of all ages can benefit from orthodontics. In fact, it’s recommended that a child come in for their first orthodontic consultation by the age of seven. It’s often less complicated to treated misalignment issues at a younger age, but many adults are successfully treated with orthodontics. .
Orthodontics aren’t only used to correct aesthetic issues. If the teeth are misaligned it can cause or contribute to a host of other issues, such as TMJ disorder and sleep apnea. Orthodontics can restore the function of a mouth that is not properly aligned and make activities such as eating and speaking easier. Many modern advancements in orthodontics have made treatment easy and comfortable. Invisalign is a system of clear, removable retainers that gradually work to shift the jaw and teeth into alignment. Since the clear retainers are removable, they are easier to clean, and you won’t be restricted in what you can eat or drink during your treatment. Many patients prefer Invisalign to traditional metal bracket braces for these reasons. In fact, Invisalign actually costs around the same amount as metal braces do, so whether you opt for Invisalign or traditional braces should be entirely up to you. Things to take into consideration when choosing an orthodontic treatment include your lifestyle, oral hygiene habits and diet (certain foods may need to be given up with traditional metal braces). If you have issues with the alignment of your teeth, we can help. Simply call or come in to book an appointment for a consultation so that we can help figure out what the best course of treatment is for you. With orthodontics, it is possible for you to achieve a more confident and beautiful smile.